Being the “healthy” girl that I am, I too, am surprised that I am not offering all kinds of guilt-free alternatives to your traditional Thanksgiving dishes. No way! OMG OBSESSED is all about fun and I believe that there is a time (or a day, at least) to splurge and enjoy yourself and let go of the guilt. Now, I know that there is nothing better than your grandmother’s homemade stuffing, but I don’t know how to make that, so, one of my Thanksgiving responsibilities around here is to make the stuffing the only way I know how. 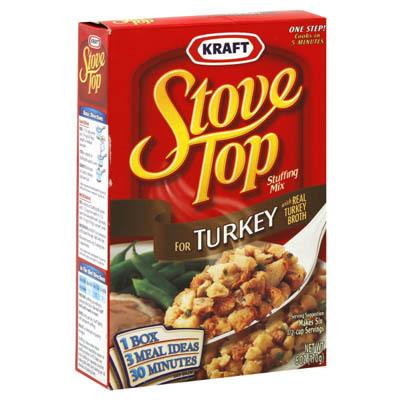 Stove Top (for turkey stuffing) makes that so easy! The directions are written on the box, it takes somewhere around 5 minutes and then you have delicious stuffing that everyone will rave about! *Important: Don’t forget to buy 1 more box than you think you will need. I always pick up an extra because I am OBSESSED with leftovers and there is never enough stuffing left. Trust me on this one. You can pick up your box(es) of Stove Top at your local grocery store. OMG OBSESSED!